The Cumberland & Dumfriesshire Farmers Mart P.L.C. had forward 5,451 Store Lambs (including Cheviots & Blackfaces) at their weekly sale at Longtown on Tuesday 7th September 2010. Store lambs were a larger entry and again upheld late high rates. Top of £66 for Beltex’s from Greenside Farm, others £61.50 Toftholm; Texel £64 Catslackburn, £63.80 Smiddy Hill, £63 Thorniewatts; Suffolk £63 Thorniewatts, £62.20 Hazelbank, £61.20 Nethertown; North Country Cheviot £62.50 Hownam Grange, £61 Meiklewhitriggs, £59 Effgill; Greyface £61.50 Townshields, £56.80 East Cragside, £56.50 Highburnfoot; Swaledale £44 East Keilder. 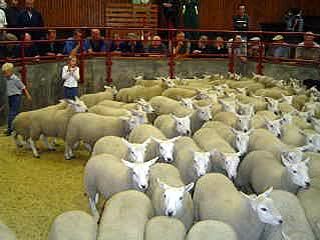 The 1,001 Cheviots were easily sold (up £8.27 on the year). Top of £62.50 for Northies from Hownam Grange, £61 Meiklewhitriggs, £59 Effgill. Hill Cheviots to £56 Sundhope, Catslackburn and East Deloraine. The 894 Blackface lambs also met a great demand, selling to £53 Crindledykes, £52.50, £51.50 Black Mountain (up £11.27 on the year).